ACL knee injury is common in sports that involve sudden changes of direction, such as football, and soccer. Most are non-contact injuries that occur during sudden twisting motion (for example, when the feet are planted one way and the knees are turned another way) or when landing from a jump. An anterior cruciate ligament injury is the over-stretching or tearing of the anterior cruciate ligament (ACL) in the knee. An acl tear may be partial or complete. Medial collateral ligament (MCL) - runs along the inner part (side) of the knee and prevents the knee from bending inward. Lateral collateral ligament (LCL) - runs along the outer part (side) of the knee and prevents the knee from bending outward. Posterior cruciate ligament (PCL) - works with the ACL. It prevents the tibia from sliding backwards under the femur. The ACL and PCL cross each other inside the knee, forming an "X." This is why they are called the "cruciate" (cross-like) ligaments. The role of the Anterior Cruciate Ligament is to prevent forward movement of the Tibia from underneath the femur. The Posterior Cruciate Ligament prevents movement of the Tibia in a backwards direction. ACL knee injury often occur with other injuries. The classic example is when the ACL is torn at the same time as both the MCL and medial meniscus (one of the shock-absorbing cartilages in the knee). This type of injury often occurs in football players and skiers. Women are more likely to have an ACL tear than men. The cause for this is not completely understood, but it may be due to differences in anatomy and muscle function. Adults usually tear their ACL in the middle of the ligament or pull the ligament off the femur bone. These injuries do not heal by themselves. Children are more likely to pull off their ACL with a piece of bone still attached. These injuries may heal on their own, or they may require an operation to fix the bone. Some people are able to live and function normally with a torn ACL. However, most people complain that their knee is unstable and may "give out" with physical activity. Unrepaired ACL tears may also lead to early arthritis in the affected knee. Coming to a quick stop, combined with a direction change while running, pivoting, landing from a jump, or overextending the knee joint (called hyperextended knee), also can cause injury to the ACL. ACL tears may be due to contact or non-contact injuries. A blow to the side of the knee, which can occur during a football tackle, may result in an ACL tear. Basketball, football, soccer, and skiing are common causes of ACL tears. The pivot-shift test, anterior drawer test and the Lachman test are used during the clinical examination of suspected ACL injury. The ACL can also be visualized using a magnetic resonance imaging scan. Pivot Shift Test- Person lies on one side of the body. Knee is extended and internally rotated. Doctor applies stress to lateral side of the knee, while the knee is being flexed. A positive test indicates a crash felt at 30 degrees flexion. Anterior drawer test- The patient is positioned lying supine with the hip flexed to 45° and the knee to 90°. The examiner positions themselves by sitting on the examination table in front of the involved knee and grasping the tibia just below the joint line of the knee. 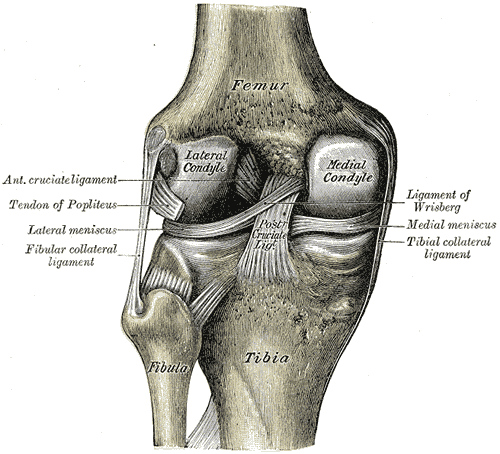 The thumbs are placed along the joint line on either side of the patellar tendon. The index fingers are used to palpate the hamstring tendons to ensure that they are relaxed. The tibia is then drawn forward anteriorly. An increased amount of anterior tibial translation compared with the opposite limb or lack of a firm end-point indicates either a sprain of the anteromedial bundle of the ACL or a complete tear of the ACL. This test should be performed along with other ACL-specific tests to help obtain a proper diagnosis. Lachman test- The knee is flexed at 30 degrees. Examiner pulls on the tibia to assess the amount of anterior motion of the tibia in comparison to the femur. An ACL-deficient knee will demonstrate increased forward translation of the tibia at the conclusion of the movement. Though clinical examination in experienced hands is highly accurate, the diagnosis is usually confirmed by MRI, which has greatly lessened the need for diagnostic arthroscopy. Decrease inflammation , swelling and pain. Restore normal ROM (especially knee extension). Provide patient education for post-op rehabilitation. Cryotherapy +elevation with the knee in full extension. Elastic crepe or knee sleeve. 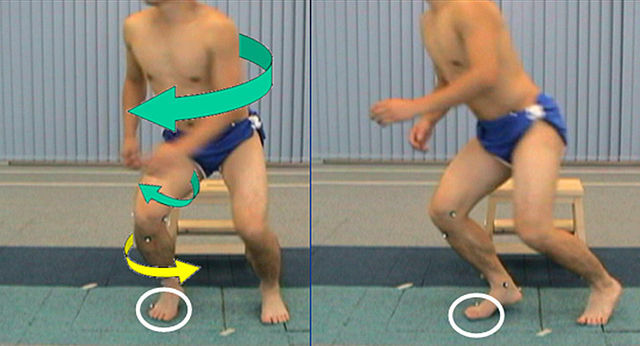 Heel slides- knee flexion upto tolerance and knee extension to 0˚. SLR– 3 way SLR(flexion, abduction, adduction). Hamstring setting( 3 times more than quads setting). Elecrical muscle stimulation to quadriceps during voluntary muscle stimulation. CKC generate low anterior shear force on the tibia whereas open chain extension places significant strain on ACL. CKC provide significant compression across the knee. CKC activates co-contraction of the quads & hams. OKC provide focused muscle strengthening (rectus femoris). With fatigue any stabilising effect of these isolated muscle is lost and can put the ACL at greater risk. CKC doesn’t provide focused muscle strengthening (vastis) and provide a safer environment for the ACL in the setting of fatigue. The aim of reconstruction is to restore stability of the knee without restricting its other functions, especially motion. PHASE 1 : Week 0-2 Goals- • Protect graft fixation. •	Minimise effects of immobilization. •	Control inflammation. •	No CPM. •	Achieve full extention, 90 degree of knee flexion. •	Educate patient about rehabilitation progress. Weight bearing- •	Weight bearing with 2 cruthes. •	Discontinue crutches as tolerated after 7 days. Therapeutic exercises for acl knee injury- •	Heel slides / wall slides. • Quadriceps sets, hamstrings sets [electrical stimulation as needed]. • Patellar mobilisation. •	Non-weight bearing gastrocsoleus, hamstring streches. •	Sitting assisted flexion hangs. •	Prone leg hangs for extension. •	Straight leg raises(SLR) all planes with braces in full extension untill quadriceps strength is sufficient to prevent extention lag. Proprioception •	Active / passive joint positioning. •	Balancing activities. • Stable platform, eyes open. •	Stable platform, eyes closed. •	Seated ball throwing and catches. Goals- •	Restore normal gait. •	Restore full ROM. •	Protect graft fixation. • Improve strength, endurence and proprioception to prepare for functional activities. Weight- bearing •	Patellar tendon graft- continue ambulation with brace locked in extension. •	Hamstring graft and allograft- may discontinue brace use when normal gait pattern and quadriceps control are achieved. Therapeutic exercises acl knee injury- •	Mini-sqats 0-30 degrees. • Stationary bike (begin with low tension and high seat). •	Closed chaion extension (leg press 0-30 degrees). •	Toe raises. •	Continue hamstings streches, progress to weight bearing gastrosoleus streches. •	Continue prone leg hangs with progressively heavier ankle weights untill full extension is achieved. Functional training- Aerobic conditioning- •	Continue upper extremity ergometry. •	Advance to two-leg bicycling. Plyometrics / eccentric muscle training- •	Stair walking- up/down, forward/backward. Aquatherapy- •	Pool walking. •	Pool jogging (deep water running). Proprioception- •	Balancing activities. •	Unstable platform (Kinesthetic Ability Training or Biomechanical Ankle Platform System board) with eyes open/closed. •	Mini-tramp standing. •	Standing ball throwing and catching. Goals- •	Improve confidence in the knee. •	Avoid overstreching graft fixation. •	Protect the patellofemoral joint. •	Progress strength, power and proprioception to prepare for functional activities. Therapeutic exercises acl knee injury- •	Continue flexibility exercises as appropriate for patient. •	Advance closed kinetic chain strengthening (one leg squats,leg press 0-60 degrees). •	Elliptical stepper, stair stepper. • Cross country skiing machine. Aerobic Conditioning •	Continue bicycling/ upper extremity ergometry. • Stair stepper/ elliptical stepper. •	Pool walking/ jogging. •	Cross country skiing machine. Plyometrics •	Stair jogging. •	Box jumps 6-12inch heights. Running •	Figure of 8 pattern. •	Straight ahead walking, progressing to running. •	Large circles, walking and slow jogging. Proprioception •	Mini-tramp bouncing. •	Pogowall balancing. •	Lateral slide board. •	Ball throwing and catching on unstable surface. Goals- •	Return to unrestricted activities. Therapeutic exercises acl knee injury- •	Continue and progress flexibility and strengthing programs. Goals- •	Safe returns to athletics. •	Maintain strength,endurence and proprioception. •	Patient education concerning any possible limitations. Brace- •	Functional brace may be recommended by physician for use during support for the 1-2 year after acl knee injury for psychological confidence. Therapeutic exercises acl knee injury- •	Gradual return to sport participation. •	Maintaince program for strength and endurence. •	Agility and sport specific drills progressed. Use proper techniques when playing sports or exercising. Several women's college sports programs have reduced ACL tears through a training program that teaches athletes how to minimize the stress they place on their ACL. Although the issue is controversial, the use of knee braces during aggressive athletic activity (such as football) has not been shown to decrease the incidence of knee injuries and may give the player a false sense of security.